Few gardens are completely flat but steep banks and slopes pose a particular challenge for most gardeners. Planting them up with the right plants can be a great long term solution. To help stabilise the soil and give speedy coverage, strong-growing climbers or ground-cover plants are required. Thorough preparation and careful planting are particularly important, as soils on banks and steeper slopes are often poor and sandy. Remove all perennial weeds and add well-rotted manure or garden compost where possible. A suitable soil test (RHS Soil Analysis Service) will help identify the soil texture and acidity or alkalinity which will influence the range of suitable plants. Acid-loving or ericaceous shrubs grow best in a pH range of 4-6, and ideally pH 5-5.5. On steeper slopes coarse coconut matting or similar material can be pegged down so that the soil on the slope, temporarily cleared of vegetation, is less likely to wash off. Plant through the matting. As the matting decays, stem-rooting plants should root-in to provide good consolidation. Make watering easier by planting individual plants on a small horizontal shelf of soil – this way the water won’t run straight off. Thoroughly water-in plants to settle the soil around the roots after planting. 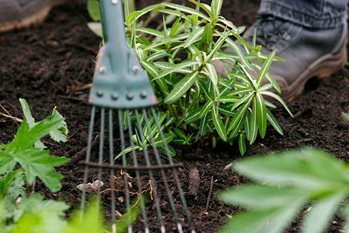 Apply a general fertiliser such as growmore (or in March following autumn planting), followed by a mulch if possible to help conserve moisture during the summer months. Keep a regular check on watering needs throughout the first growing season, including the winter months with evergreens. Suggested planting distances 90cm-1.2m (3–4ft) apart. Space closer on poor soils and in difficult situations. In good conditions effective cover should be achieved after two growing seasons.